Emil Griesback was born in Germany. Emil was one of the first comers ,arriving in Gleichen in 1883. He worked for the C.P.R.at the roundhouse, shoveling coal in the yard. He homesteaded near Gleichen before Gleichen’s boom ended and the town burned down. Emil owned a lot of property; he had houses,a store, a lumberyard (Revelstoke in 1904) and the Greisback Opera House. The Opera House hosted many travelling shows and silent pictures. A garage was opened up under the Opera House in about 1916.The Opera House and the Palace Hotel burned down around 1924. Emil married August Kirstein’s oldest daughter Ida. Their only child, daughter Lizzie, passed away at an early age. The Hoff’s, who still reside in the area, were related to the Kirsteins. In one of the history books someone said Emil was related to Colonel Greisback of Edmonton. Greisback left Gleichen for the new town of Carseland. He was well ahead of the first stores and arrived ahead of the trains. His store business failed and after 8 years he returned home to Gleichen. Emil Griesback was Mayor of Gleichen for several years. He was a member of the Ancient Order of Foresters. Emil was never known to use profane language. When he was vexed he used to say,”Mineshot tus, tus, tus. Emil was a well educated man and a beautiful hand-writer. His handwriting was so perfect it looked like type. Emil was a teetotaler. He was very well liked in his community as he was known to help out everyone, especially those in need. Eventually the town named a street after him, “Greisback Street”. He was known by the nickname ‘Greasy’. At one time, when he was having water problems, he attempted to persuade the people of the town to pipe water from the Bow River, but his proposal was turned down. In spite of all his businesses, Emil was never well off. It is said that Emil passed away in 1954, at the age of 90, without money for his funeral, and that the town and the ‘Old Timer’s Association buried him. 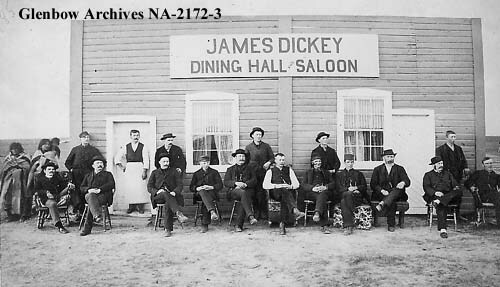 This photo (taken in 1885) of James Dickey’s dining hall and saloon shows some of the early settlers in town. Emil is in the front row 4th from the left. James is the one in the bartenders smock.